I like to ponder the power of shared needs and interests as the most direct and effective way to strengthen community. When we have common needs, we come together, and things start to get interesting. Few things demonstrate the power of people coming together like that better than Ciclovía (pronounced “see clo vee ah”), a type of event now happening on a regular basis around the world. Ciclovía’s success shows our common need for open space, fun activities, fresh air, and time with friends and family. And we all feel a common thrill in cruising down a main street that is usually dominated by cars but instead is filled with all kinds of people enjoying a diverse range of recreational activities. Forward-thinking leaders in Colombia spearheaded the concept of Ciclovía as far back as the late 1970s. Ciclovía means “bike path” or “bike lane” in Spanish and is now the term used for a successful urban event occurring in cities not only across Colombia but across the world. In Colombia’s capital, Bogotá, more than 70 miles of city streets in the heart of the city are closed to motor vehicles for such an event. More than one million people (in a city of 7 million) come out to bike, walk, skate, participate in group exercise, play music, dance, and enjoy art together. The streets are opened to city residents; they become a huge city park. Check out this inspiring video to get a feel of what happens in Bogotá. Bringing It On Home to Santa Barbara: Many communities in the United States are now hosting their own versions of “Sunday parkways” (as Ciclovías are often rendered in the planning world). The concept is compelling and seems to be most successful when it brings together diverse interests, groups, leaders, and businesses under the umbrella of one event. One of the shared needs it can meet is introducing residents to sustainable forms of transportation in a safer environment than can occur when streets are dominated by cars. Many of us in the transportation world were pleasantly surprised when we heard that the Sunday parkway concept was taking off in Los Angeles. We were collectively thrilled when the first CicLAvia in L.A. brought many thousands of participants to the downtown streets. Enjoy another video to share the excitement. Very preliminary discussions have started here in Santa Barbara about ways to bring a Ciclovía event to our fair city. It will be crucial to bring diverse leaders and interests together and to create a shared vision. The event will need to meet the needs of businesses, law enforcement, tourists, residents, and participants alike. We’re going to need to find sponsors that see and value the connections between physical activity, community, and health. We will need to choose routes that connect residential and recreational areas, and avoid areas where a street closure for this event would not help business. 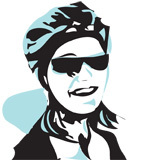 We’ll need lots of volunteers to help delineate routes and keep people safe and happy. I look forward to being a part of the discussion — and to dancing in the streets in the future! If you have ideas about what parts of the Ciclovía you’d like to see here in Santa Barbara, participate in the comments section below. 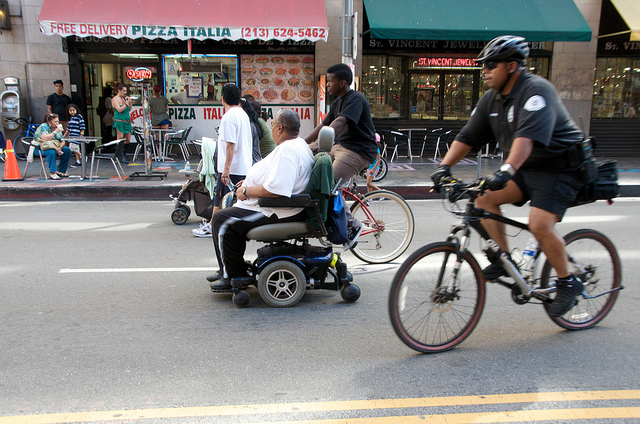 The next CicLAvia event in Los Angeles will be on Sunday, April 15, 2012. I plan to take the train down there with my bike and check it out. Who wants to join me?